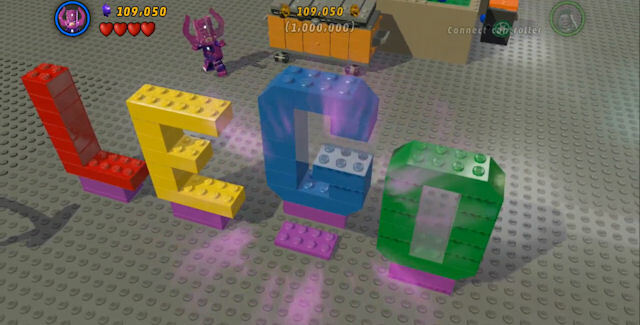 Here’s how to find, unlock & 100% complete the Lego Marvel Super Heroes Bonus Level. How to unlock the secret Bonus Level in Lego Marvel Super Heroes? It requires you to take the steps listed below. Complete the bonus level and you will be one step closer to completing the game 100%, and unlocking the “You Win a No-Prize!” achievement/trophy that’s worth 40 Gamerscore Points or a Gold Trophy. This bonus level requires you to destroy everything. Let’s go in-depth into the Lego Marvel Super Heroes New York City open world hub and find out how to access the Lego Bonus Level. We’ll give you detailed instructions each step of the way, until you know everything to unlock and complete it. STEP 1: The “The Brick Apple” bonus level only becomes available to play after you have finished the 15 Story Mode levels up to the Galactus boss fight. STEP 2: The Bonus Level is located in the New York City open world hub. You can find it on Liberty Island. That’s where you’ll find the entrance to the Bonus Level at the feet/base of the giant Lady Liberty statue; where it’s hidden at the backside of the statue, simply pass through the opening with the bright pink neon lights around it. See the video guide at the bottom of this page to find out what the area looks like. STEP 3: The only goal is to collect the 1 million studs you can find in the Bonus Level. This is done by playing as Galactus or Doctor Doom and using them to literally destroy everything in the Bonus Level*. * Tip: Although the first time you play the bonus level you only get two characters, if you play it a second time Free Play will become available. Note that any time you enter the bonus level through the door, you’ll end up in Story Mode. To be able to select Spider-Man to pull the web-handle on top of the building to get more studs, you need to play the level in Free Play, where you can select different characters at will. What you need to do to get in Free Play is select the level from the map, or go to the SHIELD Helicarrier’s inside command center computer and select Free Play from there. In this mission we get to play as Doctor Doom and Galactus and the goal is simply to collect 1,000,000 worth of studs from destroying stuff. Completing this bonus level unlocks 2 new characters designs: Captain America (Classic) and Union Jack. Sometimes these challenges in the previous LEGO games have been extremely tight in terms of how many studs you can miss. However, this particular challenge is not bad, since you can get 1,000,000 studs and still have plenty left to do. Here’s the Lego Marvel Super Heroes Bonus Level walkthrough with extra gameplay tips. These will show you how to successfully finish the secret level’s “destroy everything” challenge within 11 minutes time. For more tips, stay tuned to our “Lego Marvel Super Heroes Walkthrough” section. We hope you’ll find this Lego Marvel Super Heroes Bonus Level guide helpful. Thanks for visiting! Have you completed the Lego Marvel Super Heroes Bonus Level?